Here is part from my previous book about religion. There is plenty of evidence to prove that all major religions in the world were established on the basis of astrology or nature. The symbols and signs represent natural bodies and objects, and all we have done is assign prominence to different objects and given them various names. For centuries, people have followed what the leaders of their communities practiced. These leaders were guardians as well as spiritual leaders of their communities. Back to religious symbols, Islam has the sign of the Crescent Moon; Hindus have the sign of the Sun while Christians have the sign the cross, which divides the four elements with each house representing a star of that element. It is quite clear that the basic values of all religions are the same, and they for instance encourage us to shun evil and embrace good. In the same way, parents and guardians have always taught children what to do and what to avoid in life. This spiritual instruction is based on what is believed to be good or bad, but it is not always necessarily the truth. Despite being in the 21st century, society still expects us to follow the same old religious paths without question. I am not saying that following our old path is a bad thing, but I think it is undesirable to create fear and impose unfounded restrictions as this could turn out to be harmful and an obstacle in the development of the younger generation; and it could actually lead them astray. For example, many regions that practice Islam have imposed restrictions on women and prevented them from exploring the world. In fact, even the basic foundation of education necessary in a modern society is restricted in some places. When faced with such critical issues, it is easy to use “religion” as an instrument of control, which means that religion can be misused. My intention is not to criticize any religion, but I believe that modernizing religion could bring more peace and harmony to the world. If world religious leaders properly tackle this issue, many current problems can be resolved and steer the world onto a progressive path. I have previously stated that I believe religion is a creation of human beings established to make sense of the world and create order. Since there were no governments in olden days, people made rules and regulations to guide the society and have order. They never thought that future generations would misinterpret the meaning of religion and twist it for their own purposes. Since it was started, religion has dominated societies and many lives have been taken in the name of God and religion, and this is still happening. I therefore feel that it is important for the younger generation to think about the issue and reflect on changes needed in the current religious structure to promote unity for the next thousands of years. If we took a young child and put him into a jungle where no human being or religion exists, he will learn to respect his surroundings. If you ask the child if religion or God has saved him after a decade, I am sure that he cannot have an immediate answer. He may say that he survived because of the sustenance of water, fruits and nature. Since he is insulated from all religious influences, he will be a pure human being who has learnt to coexist with other living things in mutual respect. Once society or religion comes into the same person, he will change and be taught to see the world differently. I also have a religion, and I have full faith in God. However, to me God is not a separate entity that can be divorced from everything else. I see God everywhere and in each and every one of us. To me, nature is God: food is God, water is God and air is God- He is everywhere and in everything; God in one and God in all. We just call him different names and worship him in various ways, but He is one. If I stand in a temple praying and I stop breathing, I will die in front of God, right there in the temple. God will not be able to save me if I refuse to take in air and breathe. We therefore have to believe that nature is a supreme God because without air we cannot stay alive, regardless of what we believe. I am happy that religious leaders don’t fight over whose God has created air, and no one has yet claimed that others have no right to breathe ‘their’ air. We all have the same right to breathe, meaning that nature is one and therefore God is one. Nature is therefore God. Though we are divided by religion, things in nature like the air are indivisible and go far beyond our beliefs. 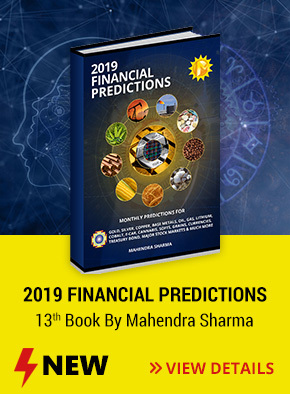 I know that you bought this book so that you would get information about trends in the world financial markets, but allow me to mention something about each religion for the next two years. It enjoys the largest following among the world’s population and is mainly spread out in America, Europe, Africa, Australia and a few countries of Asia. Within the Christian faith, there are different groups which follow different beliefs. As I stated in my last book, Christians will experience unique light in their lives and experience miraculous happenings if they place gold in the hands of Jesus. This is particularly if placed where the nails were hammered and the priest sprays holy water at the same spot. I predict prosperity among the Christian community after mid 2008, but the first half of the year will be rife with challenges especially in developed nations. The tough period ahead will partly result from economic uncertainty in the financial markets as well as housing crisis. I normally spend a lot of time researching on areas that I find interesting, and this has pushed me to work on financial markets, countries, religions, disease outbreaks and other hidden events. Research into the relationship of nature with Islam has revealed several hidden factors, for example the connection of Muslim countries with water. Water is a very lucky sign for Muslim countries because their symbol is the moon, which also represents water. Those Muslims who desire prosperity should therefore stay near water or countries or cities with seas or oceans. Examples of such countries include UAE, Saudi Arabia, Kuwait and others. The presence of ice is not a good sign for Muslim nations and those in northern Europe and northern Asia have undergone major suffering. Examples of such countries include Afghanistan, Kazakhstan, Uzbekistan and Pakistan. Cities likely to flourish in future due to their proximity to large water bodies include Zanzibar, Dar es Salaam and Mombasa, and I urge Muslims to invest in these places. I also recommend wearing symbols of the moon as well as silver, for the metal will bring luck due to its association with the moon. It could be by coincidence or religious reasons that Muslims prefer wearing silver to gold; but I think someone knew something about astrology, probably under a different name. 2008/09 looks stable for Muslim countries, but the best period ended a few months ago with the transit of Saturn from the house of the moon. Muslim countries have flourished for the last three years and there has been an extraordinary boom in oil prices. Furthermore, there has been steady growth of the property market in Muslim regions and enormous development has been witnessed in these countries. Unfortunately, I foresee a gradual decline in which falling oil prices will erode the gains made so far, and a struggling real estate market will plunge over half of the population into financial problems. Those who were actively involved in high leverage speculation in the property market will be particularly hard hit. India and Nepal are the only two Hindu nations, and it is one of the oldest religions in the world. Interestingly, adherents to this religion don’t pray to one divine entity. As a matter of fact, many faithful shift from one god to another one. Indeed, the Hindu tradition acknowledges that there are many paths through which one can achieve truth and enlightenment. Hindus follow the path of Sanatan Dharma and the guidelines that came from Vedic Shastra, striving for spiritual knowledge and seeking the right path of ethical action. In the course of the practice of Hinduism, the caste system has become one of the shortcomings, a division that arose in ancient times to symbolize the nature of work that ancestors were involved in. I am from a Hindu Brahmin family myself, and my faith has been very strong in nature and I believe that all the gods are represented in one. Jupiter will play a supportive role for the Hindu in 2008/09, and I foresee them making good progress. Gold is their lucky metal and morning is their best time of the day. This religion was founded in north-eastern India based on the teachings of Siddhartha Gautama, a young Prince, also known as the Buddha, or the Enlightened One. The foundation of Buddhism is based on the teachings of Dharma and understanding of the Atama. As the religion took shape, there was opposition from Hindu religious leaders and it shifted north into Tibet from where it spread to other Asian countries. In those days, many Asian countries lacked a particular religion and the advent of the new religion attracted mass following. Buddhism is the fourth largest religion in the world but it faces tough challenges in China. Mercury will be in favor of this religion and I therefore anticipate a positive period in which it shall attract new following. Planetary indicators also show that Buddhism and Hinduism will merge in 50 to 80 years time and their worship will become one. Christians and Muslims have some aspects of this religion, and Jesus was actually a Jew. The symbol for Judaism is a star (the Star of David) which represents unity and power, and there is also another sign which holds the seven candles (Menorah). Saturn is currently moving from the house of the Sun which represents the star, and this may result in some uncertainty for followers of this religion. Followers of Judaism could experience great success if they pray to the Sun and face it when they wake up in the morning.